The Border Collie is often referred to as one of the world's most intelligent dog breeds. When called upon they are one of the most hardworking and obedient as well, and certainly one of the most energetic. Whether they are working dogs or beloved family pets - or both - every Border Collie needs to be provided with the right nutritional elements to help ensure that their bright, energetic bodies - and their big brains - are properly nourished. And that, of course, all begins with choosing the best dog food for Border Collies. A Border Collie has different requirements to many other breeds, because their energy level is naturally high and what may be ideal for many other breeds may be far to high in energy for the hyperactive collie! However finding a complete and ready balanced diet can be hard though, as there are an ever increasing number of dog foods on the market claiming to be the best. To help you make the right decision for your Border Collie we took a look at some of the most popular and highly rated of these options, and in doing so have compiled the following 'Top Four' list. 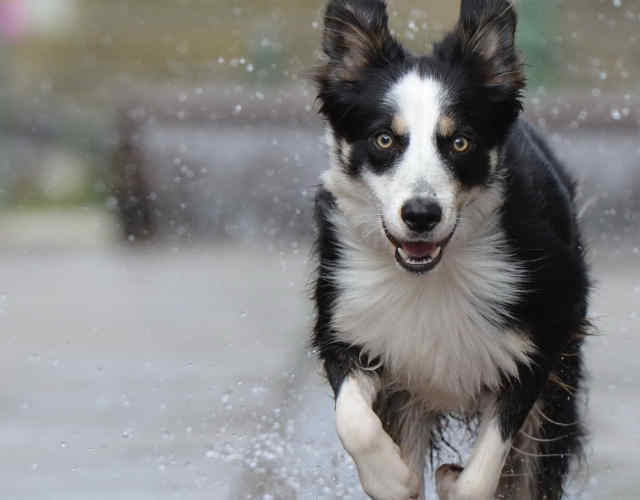 Active pups like the Border Collie need to consume certain types of protein that help maintain not increase their naturally high energy levels but also develop healthy growth and brain development. In addition, what Collies do not need is a lot of filler ingredients in their food that add calories but very little in the way of nutritional value. It's for this reason than many owners prefer a limited ingredient food like Zignature Lamb LID. 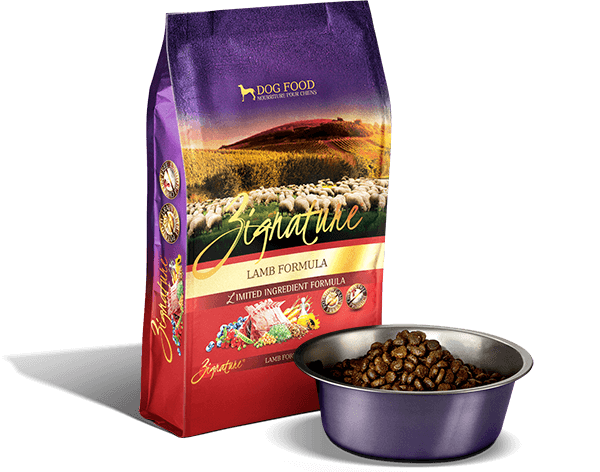 The primary protein source in this dog food is farm raised New Zealand lamb. Lamb is an excellent source of lean protein for Border Collies since the energy is slightly less than red meat energy. It is also naturally rich in the essential minerals iron and zinc. Among the most popular meats lamb also contains the highest levels of CLA, conjugated linoleic acid, a substance that has been shown to provide excellent muscle growth support and it can also help with weight control. This formula has crude proteins of 28% - ideal for mischevious Border Collie, crude fats of 16% and 435 kcal per cup. In addition to the high quality lamb this formula also contains flaxseed and chickpeas. Flaxseed is one of the richest food sources of a number of Omega 3 fatty acids and chickpeas provide fiber and help control blood sugar levels. This recipe is AAFCO approved for all life stages - another great buy if you have multiple dogs at various life stages. As it is a limited ingredient diet many Border Collies who have sensitive stomachs, or allergies do well with formulas like these as they do not contain common allergen triggers like wheat, soy or corn. Aside from its palatable taste, pups with skin issues report a huge improvement after switching to this food, often at the recommendation of their vet. First Five Listed Ingredients: Deboned Salmon, Chicken Meal, Turkey Meal, Peas, Sweet Potatoes. This is another limited ingredient dog food choice that is grain free and designed to minimize allergic reactions while also providing great, balanced nutrition. It's primary ingredient is the Omega 3 rich salmon, which is sourced from organic sources and is completely deboned. As salmon is particularly rich in the long chain amino acid DHA, it helps with brain and eye health, as well as coat condition while also serving as an excellent source of lean protein. 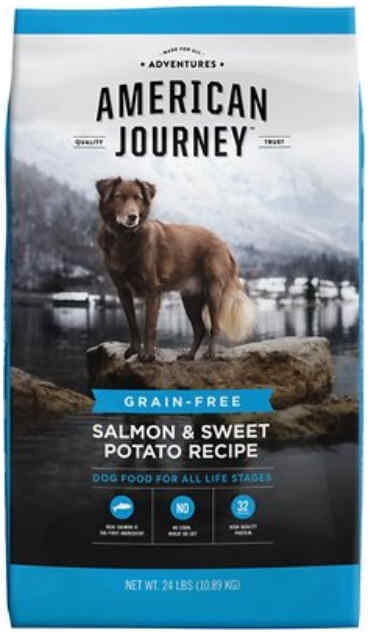 In addition to salmon the formula also contains chickpeas, an excellent source of fiber and blood sugar control and sweet potatoes that provide beta-carotene, vitamin C, and magnesium, and have anti-inflammatory properties that can help relieve joint pain in older pups. This is a higher energy food with crude proteins coming in at 32%, lower fats at 14% (crude) and lower calories at 390 kcal/cup. Fans of this food praise it for its coat enhancing properties, which are mentioned often, as well as its appeal to picky and sensitive stomached pups. Many reviewers also mentioned that switching to this American Journey formula helped clear up their pup's skin issues. What more could you ask for? First Five Listed Ingredients: Deboned Chicken, Chicken Meal, Peas, Potatoes, Pea Starch. Making sure that Border Collie puppies get the right nutrition from the start is a must. This is a breed that grows quickly and it is essential that they get all the protein, vitamins and minerals they need to support that rapid growth. At the same time puppies do, in general, often have rather sensitive stomachs so finding a food that will not exacerbate that issue is a big plus as well. Blue Buffalo Freedom Puppy Chicken Recipe lists fresh, deboned chicken as its primary ingredient and that is indeed a great lean source of protein. 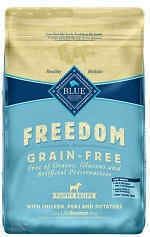 In addition the formula is grain free, so less likely to cause digestive troubles. This formula has 27% crude proteins, 16% crude fats and 403 calories per cup. The vitamins that growing Border Collies need in abundance are provided by both blueberries and Blue Buffalo's LifeSource Bits, a special vitamin supplement, and essential Omega 3 and Omega 6 fatty acids are provided by flaxseed, kelp and sweet potato. The kibble is also specially sized to be smaller and appropriately puppy sized, making it easier for them to eat and to digest. Those who have chosen this food for their puppy often mention how well they tolerate it and how the 'quality' of their bowel movements is greatly improved. Others comment on how shiny it seems to help their coats become and many also love the fact that the smaller sized kibble is so easy to digest. Most dogs prefer a little variety in their diet and enjoy wet food to go along with a high quality dry food. 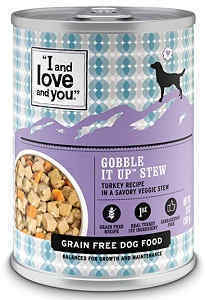 I and Love and You Gobble It Up Stew is a grain free wet food that also boasts limited ingredients to help reduce the chance of stomach upsets and to avoid adding hollow calories that dogs do not need. The primary ingredient in this wet dog food is cubed turkey. Turkey is an excellent lean protein that contains far less fat than beef and is considered a higher protein meat that does not have as much fat as red meat. It is also an excellent source of a number of B vitamins and zinc. In addition to turkey the formula contains peas, carrots, cranberries and sweet potatoes to help provide additional vitamins and minerals. The formula is grain free so is less likely to lead to allergic reactions. Fans of this wet food praise it for its chunky stew like texture and apparent good taste as well as for the fact it is well tolerated by pups with sensitive stomachs. Many also like the fact that it is a limited ingredient option that also contains no artificial colors or additives. Most experts agree: It is vital to maintain a natural development for the young Border Collie, as joints and muscles will suffer if the diet is incorrect. Over-development reduces a Collie's suppleness and under-development would result in strain. 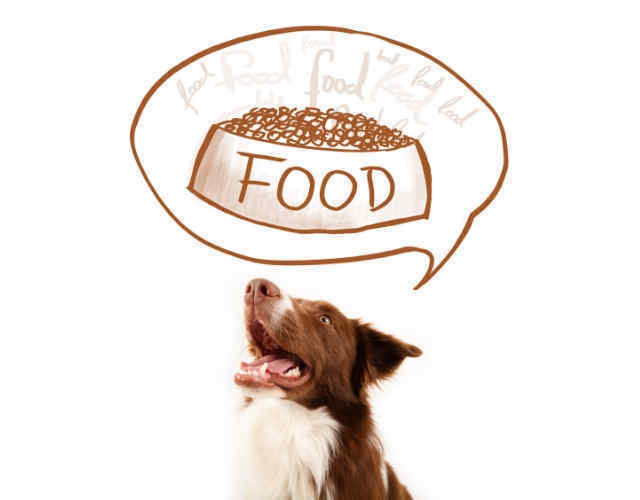 Feeding a Border Collie high-energy dog food can affect both their character and temperament. An incorrect diet with too much protein (energy) can cause your Collie to become nervous, aggressive, hyperactive, bad-mannered and difficult to handle. The foods on our list are some of the best dog foods for Border Collies that you can buy, but there are a number of other excellent choices out there. Whichever option you do eventually choose however there are some basic nutritional considerations for Border Collies that you should keep in mind as you shop. As we mentioned at the start, Border Collies are active, intelligent dogs with a lot of energy, and to support that they do need to consume a few more calories a day than more sedentary breeds. However, as older Border Collies do have a tendency to put on weight as they slow down a little (although many Borders never really do slowdown that much) this is often a delicate balance to maintain. Most male Border Collies weigh between 35 and 40 pounds and their female counterparts slightly less, between 27 and 35 pounds. According to experts at the Ohio State University Veterinary Medical Center, a body that developed some of the first formal calorie charts for dogs, an active Border Collie or similar pup's calorie needs will vary according to their activity level but it averages out at around 35 calories per pound of body weight, slightly higher than the 30 calorie general guidelines. Each brand of food will provide feeding instructions, so make sure you're feeding the correct amount of food for your Border Collie's weight. As usually very active dogs, Border Collies often do best when fed a high quality low fat meat or fish based protein. This will help maintain their naturally high energy levels without going into overdrive and build lean muscle and healthier bones. The optimum protein requirements for the average shepherding collie is between 20% - 27%. The latter or higher protein is recommended mainly for working Collies with a higher work load. So the majority of Collies will thrive on protein levels of between 20-24%. As they have rather thick coats border collies also need plenty of Omega 3 and Omega 6 fatty acids, as these help promote a shiny coat and healthier skin. While it can be convenient to set a very rigid morning and evening feeding schedule that sees your pup eat two big meals a day that may not always be the best choice for a border collie. Because they do tend to be so active, a Collie puppy may benefit from smaller meals 3 to 4 times a day. This will help spread out their calorie intake so that their bodies can make the fuel they need to keep going in a more consistent manner, preventing an energy crash in the middle of the day. Whenever you choose to feed your border collie - and you can also allow their own appetites and preferences be your guide - it's important that you remove any uneaten food after 15 minutes - to prevent overeating - and that there is a plentiful supply of fresh, clean water accompanying every meal. A Border Collie has the build of an athlete, however few owners realize the amount of strain they put on the legs in just normal physical activities. On the whole, as it is an ancient breed and has not been subject to too much extra breeding the border collie is a generally healthy pup. They are prone to a few health issues though, issues that lots of love, great vet care and even nutrition can, fortunately, usually overcome. For example, gluten-free foods are among many of the special diets available and are beneficial for problems such as stiff joints and arthritis. Vegetarian or vegan dog food are beneficial for tackling allergies and the protein is not as high in energy as meat is. Finally, chicken and rice or lamb and rice are good foods for Collies with gastric problems. Here are a few other commonly health issues Border Collies struggle with. 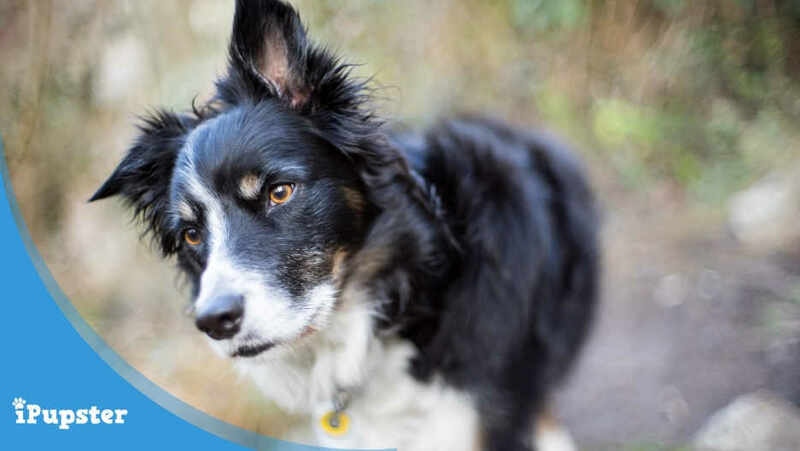 As you may have guessed, Dermatomyositis is a skin and muscle condition, usually a hereditary one that border collies are particularly prone to. The symptoms can range from the fairly insignificant - flaky skin, red patches in the skin, hair loss from scratching - to the more serious - muscle wastage and an enlarged esophagus that can make it harder to eat very solid foods. There is no cure, but there are effective treatments. If their skin rashes are severe pups can be prescribed medication but many thrive - and improve - with an increase in their diets in Vitamins A, C, and E, all of which are power antioxidants that can help heal damaged skin and prevent new damage as well as Omega 3 fatty acids that can do the same. Older border collies do sometimes develop cataracts (as is the case for many dog breeds.) This can be hard to prevent, but paying extra attention to your pup's eye health from an early age can be very helpful. Making sure they consume plenty of eye health nutrients is a must. These include Vitamin A, which plays a crucial role in maintaining the health of the cornea (where cataracts form) Vitamin E, to protect the delicate issues of the eye from free radical damage and the B vitamin riboflavin. Recent studies have found that cataracts may form when a pup - or a human - is riboflavin deficient, so ensuring that that does not happen is a great way to help keep their eyes clear and healthy for as long as possible.